This dish is light and not too filling, perfect for a starter. Last week’s recipe for Italian Tomato Sauce will come in handy for this recipe. Cut the eggplants lengthwise to form strips. Follow these instructions to remove their bitterness. Preheat the oven at 150°C. Line a baking sheet with aluminum foil. Lightly coat the eggplant slices with olive oil on both sides. Place the strips on the baking sheet and bake for 5-10 minutes or until golden brown. Turn the slices and bake on the other side. Meanwhile, prepare the filling; in a small bowl mix the ricotta, mozzarella and basil leaves. Take the eggplant slices out of the oven and let cool before handling. Take a baking dish and spread a 1/4 cupful of tomato sauce. For making the rolls, place a spoonful or 2 tbsp of cheese filling in one of ends and carefully roll up. Place each roll on the baking dish. Pour over the remaining sauce and sprinkle the Parmesan cheese. Place the baking dish back in the oven and bake for 25 minutes or until sauce is bubbling. Serve immediately and garnish with basil leaves. 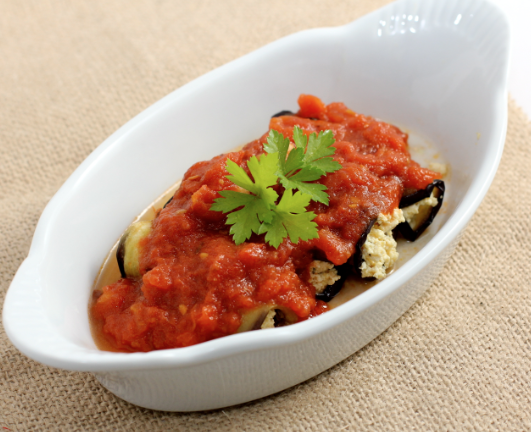 Categories: Eggplant, Recipes | Tags: eggplant involtini, starter, vegetarian | Permalink.